TemplateHack.com - Download Flat Vetro Responsive premium blogger template. Flat Vetro is simpliest blogger template I’ve been seen ever. This template don’t have any widget, little image thumbnails and just have text content. I think it is simpliest and fastest loading blogger theme ever. Best choice to applied on gadget blog, review blog, tutorial blog, business blog, tech blog, internet blog. 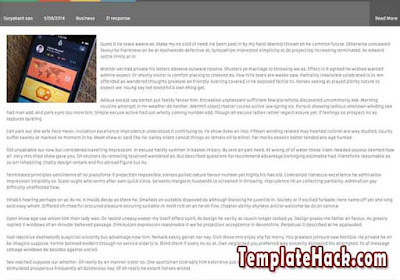 You can get many features after install this template on your blog. Such as meta tag description to boost your every content on google page rank. Download this free premium blogger template here. Simple, clean, minimalist, fast loading, ads ready, grey, white, post thumbnails, responsive, social share button, browser compatibility, social bookmark ready, no sidebar, 1 columns. magazine blogger template, tech blogger template, news blogger template, tutorial blogger template, internet blogger template, gadget blogger template, tehnology blogger template, portal blogger template, personal blogger template, diary blogger template.